Love it or leave it, it's as simple as that. If you don't like it, we will sell it... for free! If you are unhappy with your purchase and decide to sell within three months, we'll waive our share of the listing fee. We will waive our listing commission and provide FULL services to list and sell your property. Your home will likely be the greatest financial investment you'll ever make. With the help of a Neal Estate Team real estate agent, it can also be your wisest. Set yourself up for long-term success with the help of our professionals. Schedule Your Buyer's Consultation Today! Find out where you stand in Victoria's real estate market. Schedule a meeting with one of our buying specialists and learn more about our exclusive home buyer guarantee now. 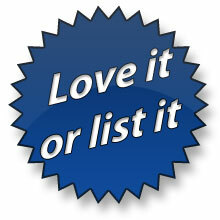 The Love It or List It Guarantee does come with some limitations to protect our team while still offering you top-notch service. The incentive to list for free does not cover charges from other parties, including the buyer's broker commissions, closing costs, and so on. The result is that fees are cut in half. This is strictly just the listing fee and commission of The Neal Estate Team. This advantage is not available to properties purchased with the intent to flip. Buying a home is one of the biggest decisions and financial investments you'll make in your life. With the help of our Victoria real estate professionals, we can help ensure it's a seamless, stress-free, and successful transaction. You see what we see. It's as simple as that. New homes hit the market every single day. Our website refreshes the listings every 15 minutes, which means you have the most recent source of listings at your fingertips. Register for an account, create a saved search, and receive notifications when properties matching your wants and needs hit the market and as soon as they hit the market. Your agent will work as an offline resource, connecting directly with sellers to find out about listings before they're made public. In many cases, this will beat out the competition and walk away with a great deal on the property of your choice. Your Neal Estate Team agent will save you valuable time by ensuring you only see properties that matter to you, based on your needs and investment preferences. During the purchase of a home, there are many things you should consider beyond the listing price, like the history of property values in a particular neighborhood, what could change in the area over the next five years, and so on. Sure, you could do some research on your own, but this is what we do. We've dedicated our careers to knowing the Victoria real estate market and all its intricacies like the back of our hand. This in-depth market knowledge and decades of experience make us the top choice in our market. Whether you're buying for yourself or looking to invest, put our expertise to work for you! If you're interviewing other real estate agents, you should be asking them these important questions! Not only is The Neal Estate Team #1 in the Greater Victoria market, but no one has sold more with RE/MAX on Vancouver Island since 1998. We're also in the Top 100 with RE/MAX, globally, of more than 100,000 agents in almost 100 countries. Our team members have won numerous awards with RE/MAX and VREB. The Neal Estate Team comprises 12 full-time professionals, each of whom is responsible for a specific process in the selling of your home. We have a customer experience manager, listing care coordinator, social media and internet specialist, graphic designer, photographer, videographer, marketing manager, client care coordinator, team courier, building inspector, mortgage broker and experienced sales partners specializing in commercial, luxury, listing and buyers. DO YOU DO DIRECT RESPONSE ADVERTISING (ADS THAT USE POWERFUL HEADLINES, COMPELLING COPY, AND AN OFFER AND CALL-TO-ACTION THAT GENERATES RESPONSE)? Yes, we do direct response advertising, generating thousands of inquiries every month and providing 24/7 immediate response. We believe that the faster response we give, the more response we generate. Our team has innovated many exclusive consumer programs which make the process of buying and selling a better experience for our customers. We will create an accurate and professional presentation of your property and ensure it receives massive exposure. We guarantee to advertise your home 24 hours a day, 7 days a week until it is SOLD. Our office is open from 8am to 9pm and our team is always ready to jump in and help. We also have an after-hours Live Chat option online and Autobot response system on social media. We are frequently complimented on how responsive we are. Once you start working with us, you can reach us very easily, but the truth is that you will enjoy the customer service we offer. All of this is just to simplify and reduce your stress with this important process. We are committed to exceeding each customer's expectations. Our team is in full control of our advertising program which, with a monthly investment consistently exceeding $30,000, is by far the most extensive in Victoria. Furthermore, our founder is the broker and owner of RE/MAX Alliance Victoria, home of Victoria's most productive agents. Our innovative and exclusive system will help you sell your home fast and for top dollar. We are currently working with over 1000 buyers on our exclusive Buyer Profile System. We generate extensive buyer inquiries from our websites which receive more than 15,000 visitors monthly and we receive hundreds of introductions annually to qualified and motivated relocating buyers from our many national and international referral partners. We pre-qualify these buyers before they view your home and assist them through the process. One of the most important benefits we offer is to tell you the truth about the value of your home at the start. We often sell homes after other agents have failed. Because of our experience and record of success, we offer a few programs that other agents can't. Our Easy Exit Listing contract and Guaranteed Sale Options provide sellers with peace-of-mind and security. Our innovative and exclusive systems and programs will help you sell your home fast and for top dollar. We are currently working with over 1000 buyers on our exclusive Buyer Profile System. We generate extensive buyer inquiries from our websites which receive more than 10,000 visitors monthly and we receive hundreds of introductions annually to qualified and motivated relocating buyers from our many National and International referral partners. We pre-qualify these buyers before they view your home and assist them through the process. One of the most important benefits we offer is to tell you the truth about the value of your home at the start. We often sell homes after other agents have failed. IF I DON'T LIKE YOUR PERFORMANCE, MAY I CANCEL OUR LISTING AGREEMENT AT ANY TIME? Every listing provides a no-hassle written option to cancel: Easy Exit Listing Details. Our marketing is by far the most extensive, effective and successful available in our marketplace resulting on average that we sell our listings for 102.3% of the listed price and Average Day on Market of 16 days. Our massive global network in more than 100 countries is aligned to reach the best most motivated buyers for your home. Considering the purchase of a home soon? Request a personalized home buyer consultation from the Neal Estate Team. Whether you plan to buy in a year or you're ready to start the house hunt today, our team members are ready to assist with your next move!